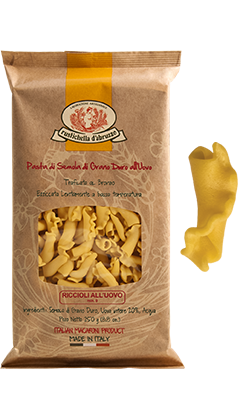 Rustichella d’Abruzzo special Regional egg pasta contains the history of Italy. From the North to the South, a blaze of tastes and perfumes tells the history of the Bel Paese and its old culinary traditions, together with our experience, passion and dedication. 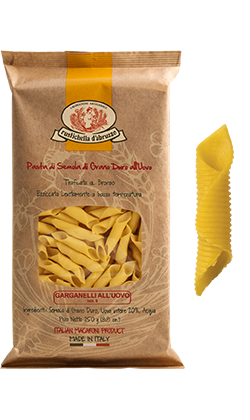 The fresh eggs, top quality durum wheat semolina and the captivating packaging are the plus of Regional types of pasta, very well appreciated especially overseas. An old saying goes “Se le farfalle possono volare 1000 km, pensa a quello che puoi fare tu” (if butterflies can fly 1000 km, just imagine what you can do”). 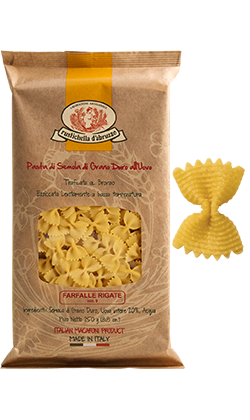 Rustichella d’Abruzzo Farfalle Rigate all’Uovo brings into your kitchen the love for food and the traditional recipes. The aim of the stripes on the outer surface is to collect the condiments and make them stick to it, just like the pollen sticks to the wings of the butterflies. For this reason, we recommend Farfalle Rigate with full-bodied sauces, such as ‘alla Genovese’ or ‘rosso alla Salsiccia’ by Rustichella. For the lovers of more intense tastes, we recommend it with a condiment made of fresh stir-fried sausage with broccoli and radicchio and a bit of Rustichella d’Abruzzo PrimoGrano INTOSSO monocultivar Extra Virgin Olive Oil. Cooking time: 9 minutes. Rustichella d’Abruzzo Riccioli all’Uovo has the perfect shape to satisfy all the palates, even the most demanding ones. Thin, rough and porous “curls” of egg dough that collect the condiment on the inside. Try Riccioli in the ‘mari e monti’ version, with seafood, chickpeas and a bit of Rustichella d’Abruzzo PrimoGrano INTOSSO Extra Virgin Olive Oil. You can also try it with one of our sauces, such as ‘alla Norma’ or ‘all’Ortolana’. Cooking time: 9 minutes. Rustichella d’Abruzzo Garganelli all’Uovo is a type of pasta originally from Emilia Romagna, very much loved and appreciated especially abroad. Thanks to its particular shape and the stripes on the outer surface, Garganelli can be prepared in broth, combined with some of our sauces like ‘alla Salsiccia’ or ‘alle Olive’, or with a vegetable pesto, pine nuts and Pecorino cheese, for the lovers of a healthy and well-balanced lifestyle. Cooking time: 9 minutes.